Move over Indio, Southern California&apos;s next great music festival could be just over the Arroyo Seco Parkway. The Pasadena City Council voted just before midnight on Monday night to officially authorize a days-long annual music festival at the Rose Bowl. The Arroyo Seco Music and Arts Festival would premiere in June 2017 and be produced by Anschutz Entertainment Group (AEG), the company behind Coachella, in partnership with the Rose Bowl Operating Company. The annual festival would feature a diverse roster of musicians across four stages, as well as room for bookstores, art exhibits and plays, according to the Pasadena Star-News. Plans also include food and beverage concession stands, one or two "iconic" carnival rides, and merchandise stations, along with lounge and VIP areas (obviously). Organizers say that the family-friendly festival would boost Pasadena&apos;s national profile and provide an economic stimulus to local businesses, restaurants and hotels. The Arroyo Seco Music and Arts Festival would eventually have a capacity of up to 90,000 attendees daily, but would be limited to 75,000 daily attendees in its first year, according to Pasadena Now. It would take place over a three-day period (Friday through Sunday) each June at the Rose Bowl Stadium and surrounding grounds, including the Brookside Golf Course, both of which are located in western Pasadena. Monday&apos;s vote, which took place after more than five hours of public comment and discussion, certified the final Environmental Impact Report (EIR) for the proposed festival and officially authorized the Rose Bowl Operating Company&apos;s general manager to enter into an agreement with AEG for up to 20 years. Anyone who has ever braved Coachella is well aware of the traffic impacts of a major music festival, so it should come as no surprise that addressing traffic mitigation has been a major part of the planning thus far. David Sanchez, a senior planner with the City of Pasadena, spoke with LAist about the plans. Sanchez, who helped draft the EIR, said that the proposal seriously addresses the festival promoter&apos;s ability to manage traffic and that plans will continue to "mold and evolve" with the process, "and hopefully work out into something that the city at large will be comfortable with." "The way it&apos;s proposed is very different from Coachella," Sanchez told LAist. "Central Arroyo is a totally different environment with different street patterns." 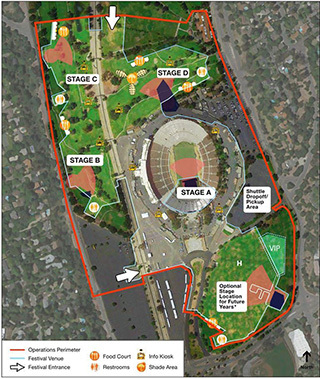 Plans created by the Rose Bowl Operating Company and the City include coordinating with Metro and other local transit providers to ensure that transit service will adequately meet the demands generated by the festival, and developing an extensive local outreach program to gather community input on traffic management. Bicycle use and carpooling would both be incentivized, through a bicycle valet system and a "Carpoolchella"-style carpool/vanpool program, respectively. Five off-site parking locations would be used for the proposed festival, with three in Pasadena, one in Arcadia, and another in Los Angeles, according to the EIR. "There will be no one down in the Arroyo Seco who doesn&apos;t have a ticket," AEG producer Nic Adler told Pasadena Now, explaining that tickets will be obtained off site and designated parking would also be provided with ticket packages, "eliminating searching for parking spaces, as well as ticket scalpers at the Bowl." Rendering courtesy of the City of Pasadena. 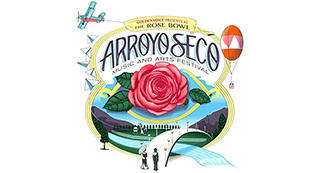 The seeds for the Arroyo Seco Music and Arts Festival were first sown in 2012, when the Rose Bowl Operating Company raised concerns about the Rose Bowl&apos;s long-term financial stability as competition from similar local and regional venues increased (the EIR lists Dodger Stadium, the soon-to-be-renovated Coliseum, and the proposed NFL Stadium as potential competitors). Pasadena Now reports that the Rose Bowl Operating Company, seeking a reliable revenue stream, decided to target an annual music and arts festival the following year. AEG, one of the world&apos;s largest event promoters, was soon identified as the preferred partner. 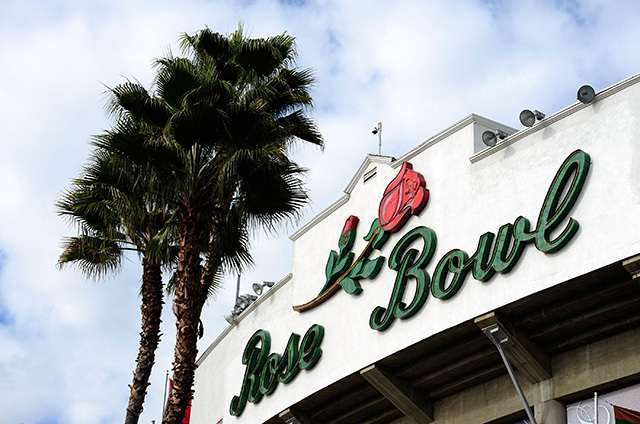 Darryl Dunn, the Rose Bowl Operating Company&apos;s CEO and general manager, has said that the festival is projected to generate between $90 million and $106 million over the proposed 20-year period, according to Pasadena Now. An Economic Impact Study of the festival quoted in Pasadena Now projected a total of $385 million in potential overall economic benefits to the city over the life of the festival, as well new jobs for Pasadena residents. Dunn told LAist that winning over community support has been an ongoing process, estimating that his staff and AEG have probably met with over 50 different groups. "For the most part, people who live near the Rose Bowl want to see it be successful," Dunn told LAist. "They just want to be confident that their interests will be taken into account." Dunn sees the proposed music festival as more than just a splashy partnership or second anchor for the Rose Bowl&apos;s calendar. In his view, the reasoning behind the Arroyo Seco Music and Arts Festival lies deep in the city&apos;s history. "More than 125 years ago, some people moved to Pasadena and thought that one way to highlight this community would be to put on a parade," Dunn said, referring to the city&apos;s storied Rose Parade. "They were visionaries." "And the people who ultimately decided to build a football stadium in the Central Arroyo when it was a junkyard, they had vision," he said. For Dunn, the Arroyo Seco Music and Arts Festival is a logical next step in the city&apos;s cultural trajectory, and one that he hopes will someday seem both obvious and visionary. Note: This post was updated after publication to include statements from Darryl Dunn.